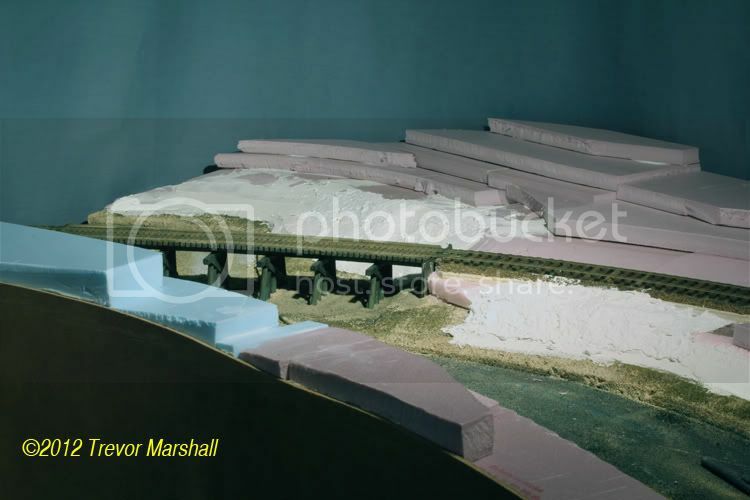 Over the past few days, between other commitments, I have spiked all the rail on the four-track sector plate. It’s not completely spiked – only every sixth tie or so – but it’s enough to test the track. I will go back and spike it every second or third tie as time permits. There are a few ties that need to be replaced – they came loose while sanding, but I can stain them and slip them under the rails. There are also gaps at the ends of each track – these will be filled with squares of printed circuit board so I can solder the rails to them. This will keep everything in alignment across the gaps to the main track into St. Williams, and to the cassette used to turn locomotives. I wired each track separately, so that in the future I can add switches to automatically power only the track that’s lined up with the mainline into St. Williams. While the sector plate was off the base, I cut a square opening in the base to pass the wires through, with enough space to pass a plug as well. 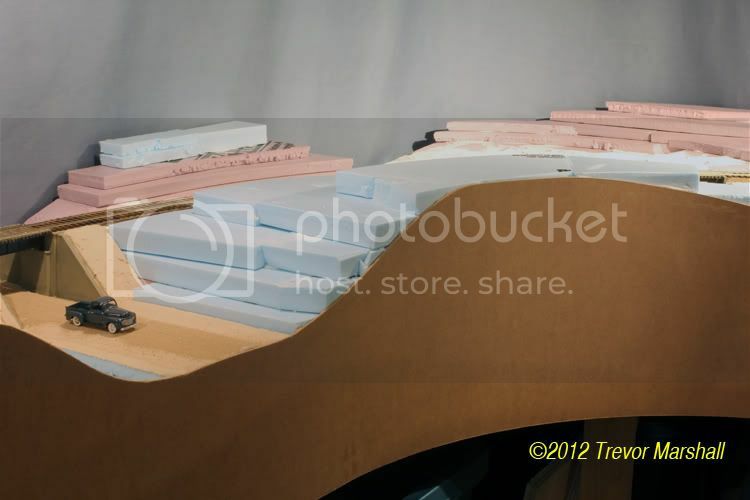 As the photo shows, I’ve added labels to the gold wires so I know which track they power. 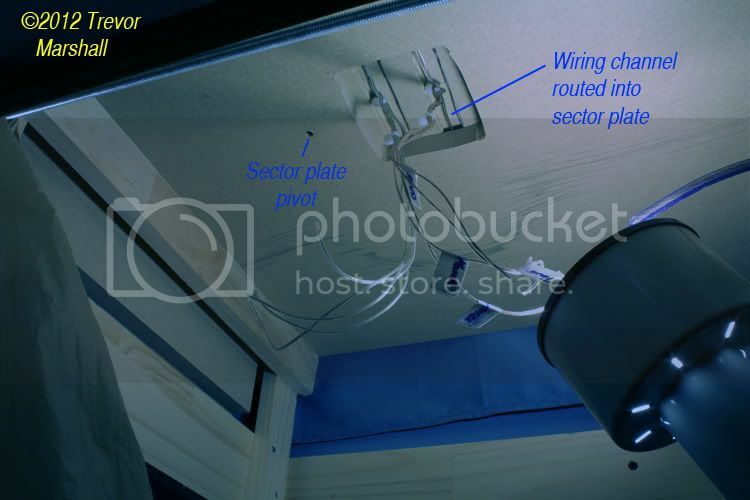 The silver wires will be wired together as a common return. I am very, very close to having all track done and wired. Yesterday was a perfect day to say goodbye to Rich. Hundreds of friends, fellow model railway enthusiasts and classic British sports car fans joined family at a winery in the Niagara Peninsula to celebrate Richard Chrysler, who passed away earlier this month – at 59, far too young. The weather was spectacular and the event was indeed a celebration. I remarked to a few people that it felt more like a birthday party. Despite the unfortunate circumstances of our gathering, it was great to catch up with so many people that I haven’t seen in a long while – just the sort of thing Rich would’ve been proud to have a hand in making happen. I’m confident that, overall, he would’ve approved of the day. A special thanks to his family for organizing such a wonderful celebration of a great life! 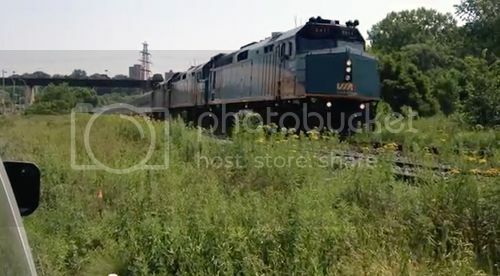 A friend emailed me privately to comment on the “wonky” (his word) rails in my recent track level shots of Port Rowan. The truth is, my track laying skills are adequate – but not great. This is one reason I favour small branchlines, short lines and narrow gauge railroads: I could never lay track worthy of the Pennsylvania Railroad in the Second World War or of the modern Union Pacific. When I did this section I was at first disappointed I had a jiggle’n’jog. But then I realised it added character to the track that was in line with the overall effect I’m attempting to achieve on this layout. By the 1950s, the Port Rowan branch’s days were definitely numbered. Rails were practically lost in the grass, traffic was disappearing to trucks, and I doubt maintenance was high on the list. “Keep the flanges off the ties” was probably the plan. So I decided to not worry about the wonky rails – providing my trains stay on them. At the slow speeds I’m running – the prototype’s 15 mph speed limit is enforced by custom decoder speed tables – this hasn’t been a problem. 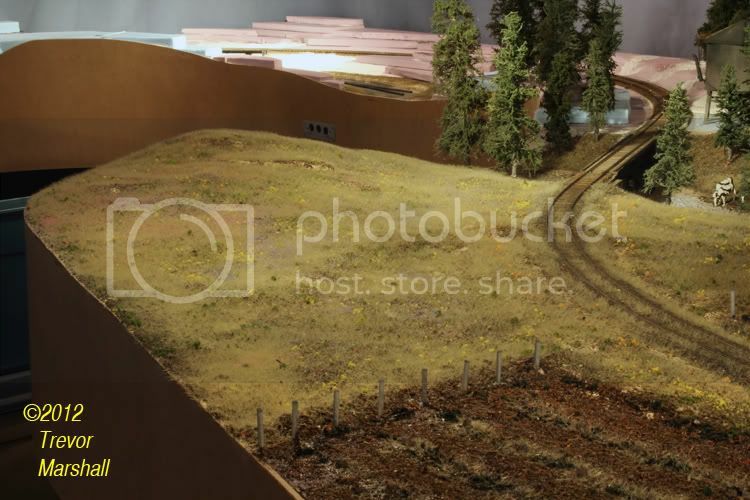 It received a lot of positive comments, even though – as is obvious looking at it now – there was no other scenery (or even terrain) on the layout at the time. I see lots of opportunity to further detail this scene without spoiling the effect of a lonely branchline terminal. But so far, so good! Simcoe, Ontario is where the line from Hamilton splits into two branches to serve Port Rowan and Port Dover. 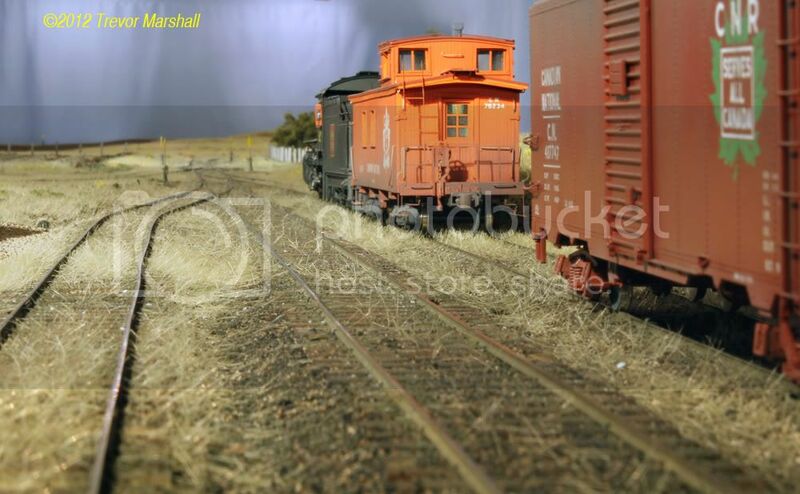 It’s also the start of yard limits on the Port Rowan branch. 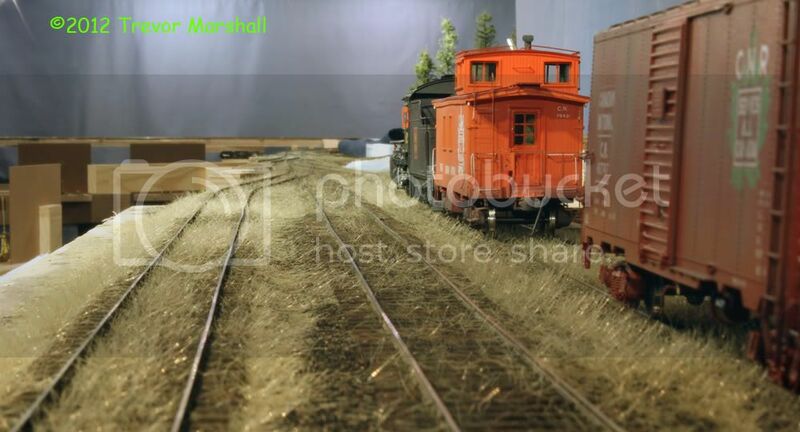 So it’s as good a name as any to apply to the staging area on my layout. For a number of weeks now, I’ve had all ties down but the end of rail has been the #10 switch by the depot in St. Williams. This week, I’ve started the last of the track work – the main north of St. Williams (all five or six feet of it) and the four tracks on the sector plate. 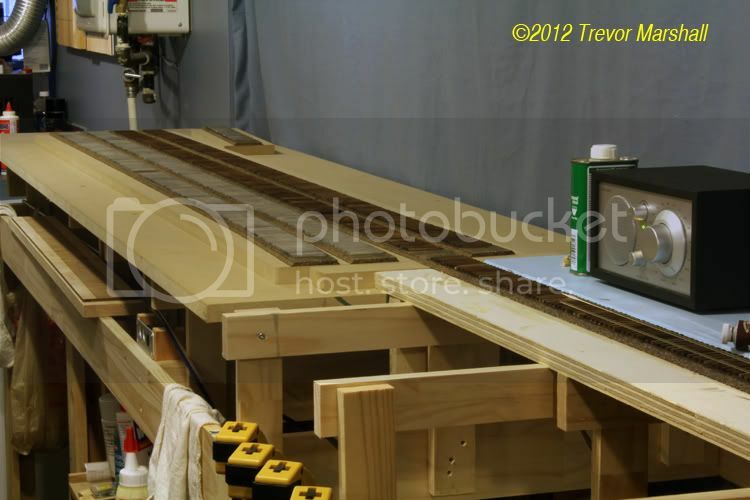 The mainline is the section in front of the radio on the benchwork, and it’s now ready for rail. Also seen here is progress on the sector plate. All four tracks have received an initial stain of grey, and the two back tracks have now been overpainted with oils. I’ll finish the other two tracks, then let everything dry (oils take a bit of time to lose their stickiness) before starting to spike. I’m still debating whether to add ballast on the sector plate. I might, because the ballast/glue combination does a great job of locking things together. On the other hand, I will have to be extremely careful to not glue the sector plate to the benchwork! Fortunately, the whole plate lifts off, so if I decide to ballast I can do this off the layout to prevent accidents. 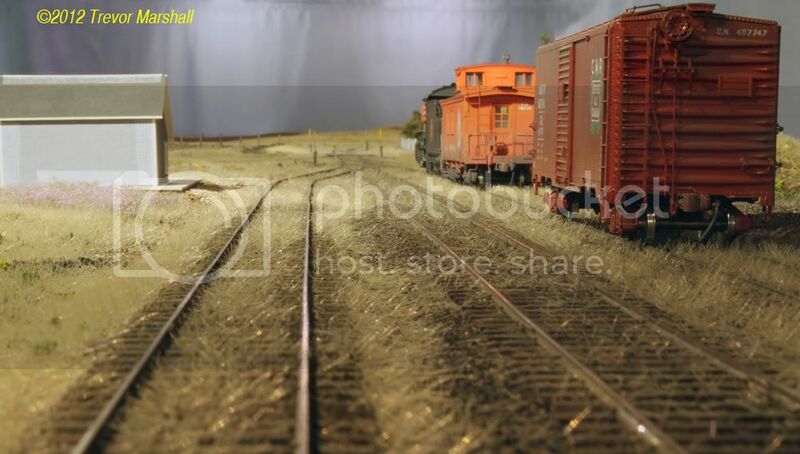 Last Friday, John Mellow and I visited our mutual friend Pierre Oliver to spend the day working on his HO scale layout, which represents the Wabash Railroad’s Buffalo Division. 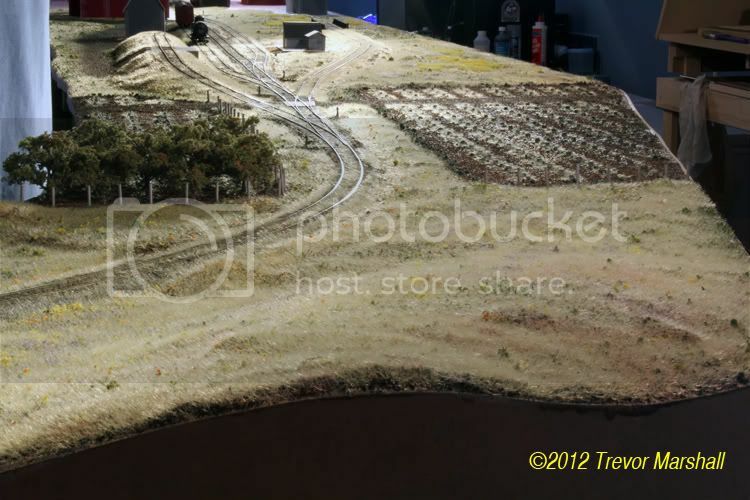 At Pierre’s, I returned to my work in his model of Delhi, Ontario. I’ve been laying track, including spurs into the Imperial Tobacco plant there, and I celebrated a milestone on Friday by finishing the spiking of all turnouts. 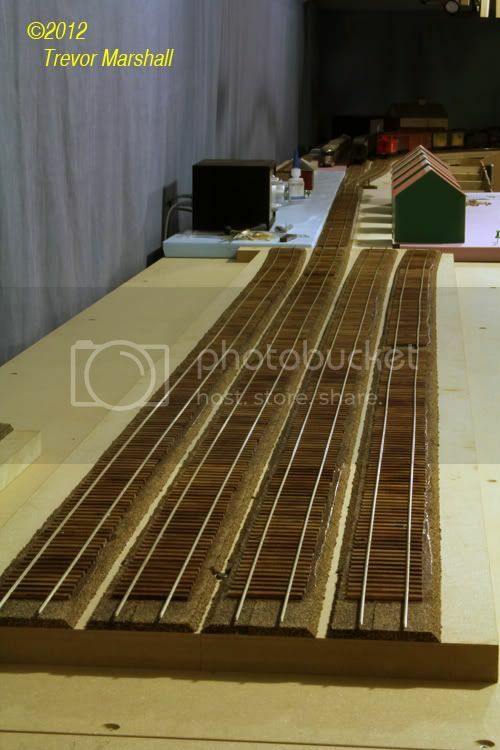 The area still needs to be wired and then the track work can be properly tested under power. John performed surgery on some structures for Aylmer, Delhi and Courtland, while Pierre busied himself with track in Courtland. Progress is progressing – and I’m looking forward to the day when we can run the first Red Ball over the line! 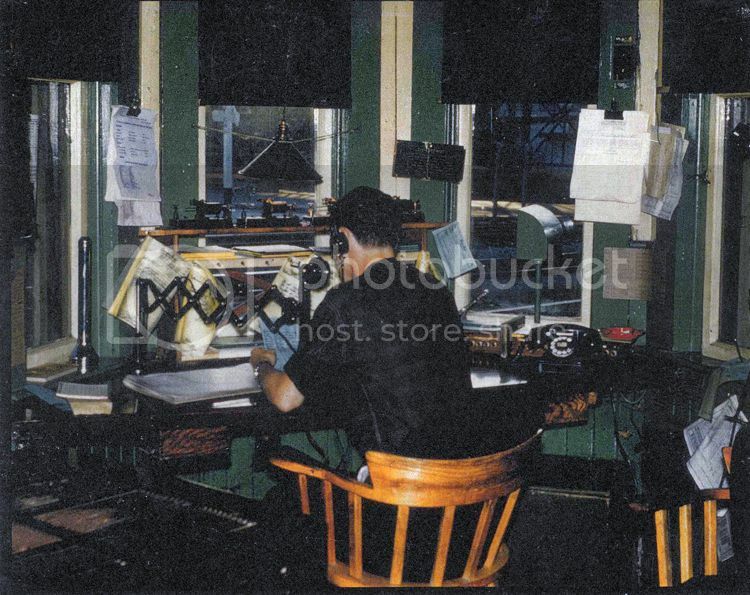 Last Thursday I had a mini-open house for the layout – five friends and their wives dropped by for drinks and a tour, then we retired to The Caledonian for dinner, where owner Donna Wolff treated us wonderfully. Thanks to Mark/Joyce, Chris/Melanie, Mark/Sharon, Daniel/Martha and Andy/Terry for coming out. We’ll do this again! The area around Port Rowan is pretty flat but after talking with Chris Abbott during a recent work session, we decided a low rise would look nice at the entrance to Port Rowan. It would help justify the sharp curve out of the Lynn Valley before hitting the straightaway between the orchards. And the rise would help hide the Stone Church Road scene across the aisle when visitors are looking north out of Port Rowan. Having glued together stacks of foam board in this area to give me the basic shape, today I tackled it with carving tools. When I was happy with the rough shape, I spread a layer of Sculptamold over the area and topped it with paint and various ground covers. Later, I flooded the area with dilute Weld Bond glue and added static grass and some meadow flowers. There’s still more to do, including the addition of bushes and trees. But the scene is coming together nicely. I’ve been slicing, stacking and sticking layers of foam board to create the basic terrain in the Lynn Valley. I’ve now filled in around the trestle and up to the west side of the Stone Church Road overpass in St. Williams. Next step – shaving, sawing and shaping to create gentle slopes and a rock cut. Something a little different – about as far from Port Rowan in the 1950s and one can get. I’m really glad I did – it was one impressive passenger train, especially in the 21st century!